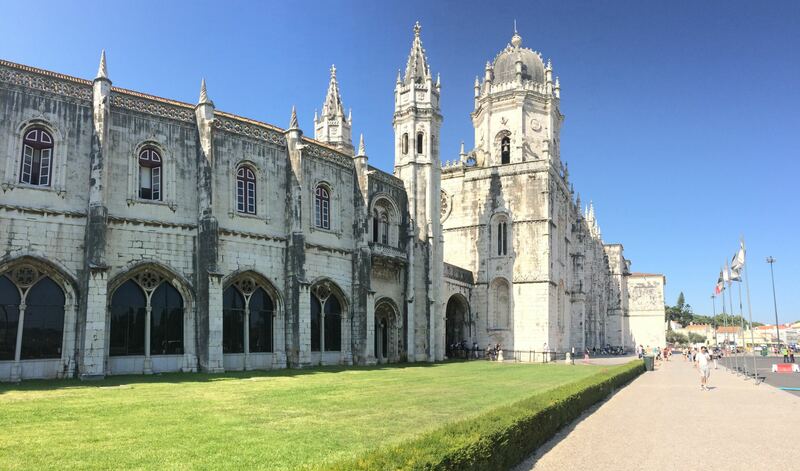 A week in Lisbon is full of Baroque churches, Moorish castles, pastel painted buildings and historic tramways, dotted with sunny day trips to Cascais, Belém and Sintra. If you’ve got a week booked and you’re not sure how to fill it, try this itinerary put together by Matt! 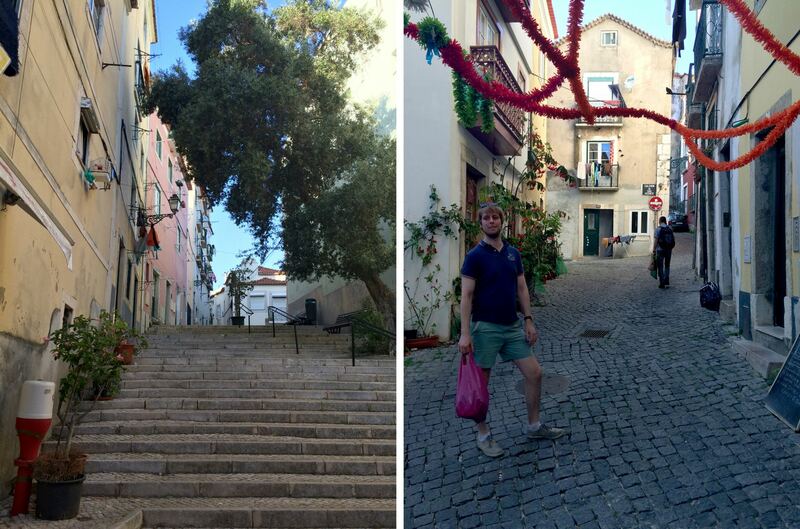 The first day is the day when you get your bearings, and Matt planned the perfect walking tour of the Alfama district so we could get to know the area we were staying in. 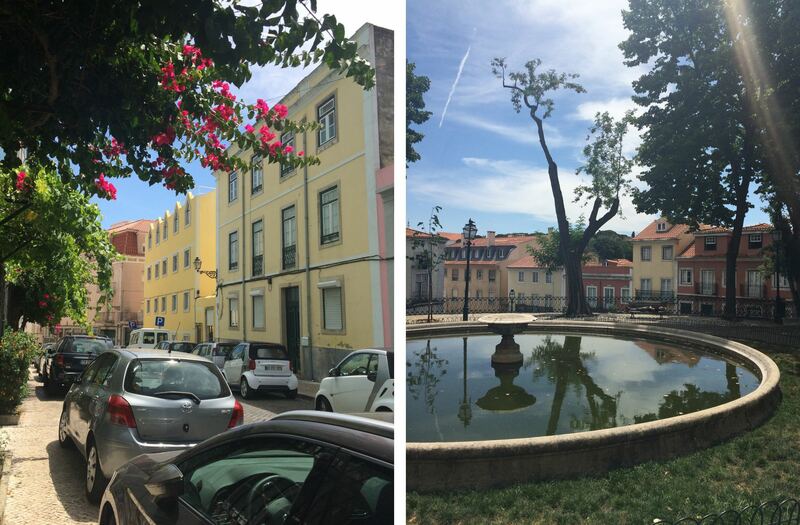 The oldest district in Lisbon, Alfama is the historic centre of the city, home to Fado music and many sights including the the Panteão Nacional, Lisbon Cathedral and Catelo de S. Jorge, all of which you’ll get to tick off on this route. 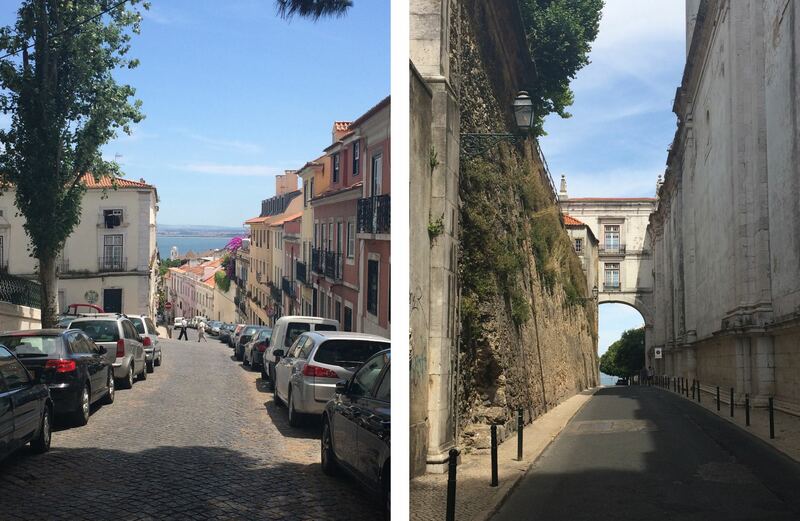 First up we’re going to walk up to Miradouro Sophia de Mello Breyner Andresen, a terrace just off a pretty garden at the top of Alfama that will give you a beautiful panoramic view over Lisbon. Left: Painted houses on Travessa das Mónicas. Right: Jardim Augusto Gil. 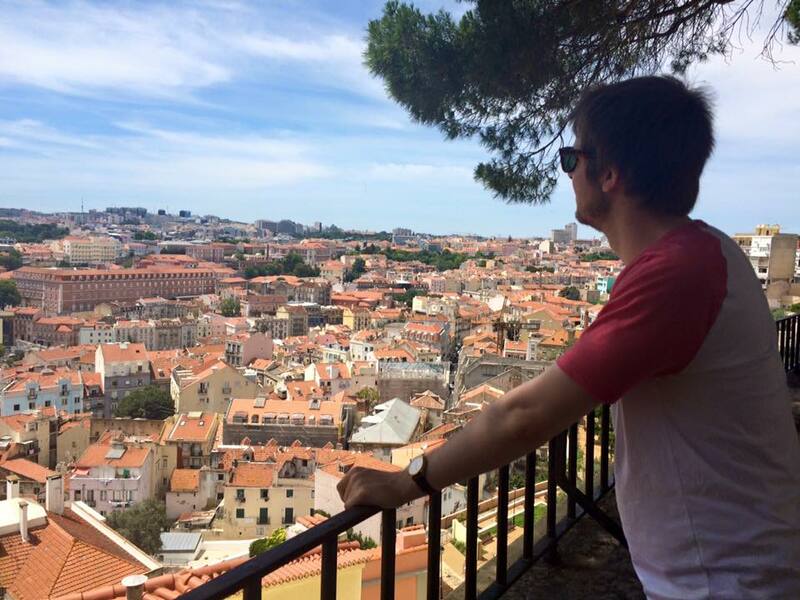 Looking out over Lisbon from Miradouro Sophia de Mello Breyner Andresen. I personally love terracotta roofs and the warm welcoming aesthetic they create. Seeing a view like this is what makes me really feel like I’m on holiday. Tiled Villa Sousa on Travessa das Mónicas. 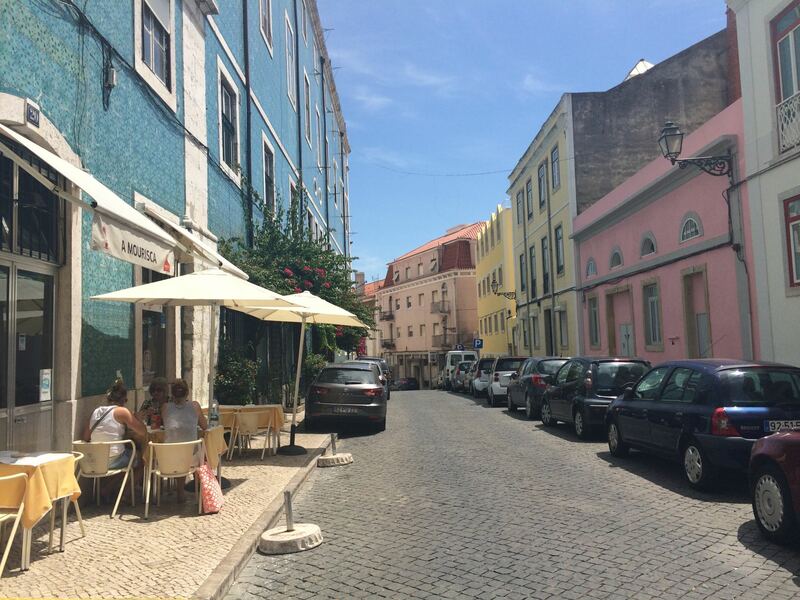 Alfama is absolutely littered with cafes and bars, so don’t hesitate to stop and relax at any point on this route. You’re on holiday afterall! 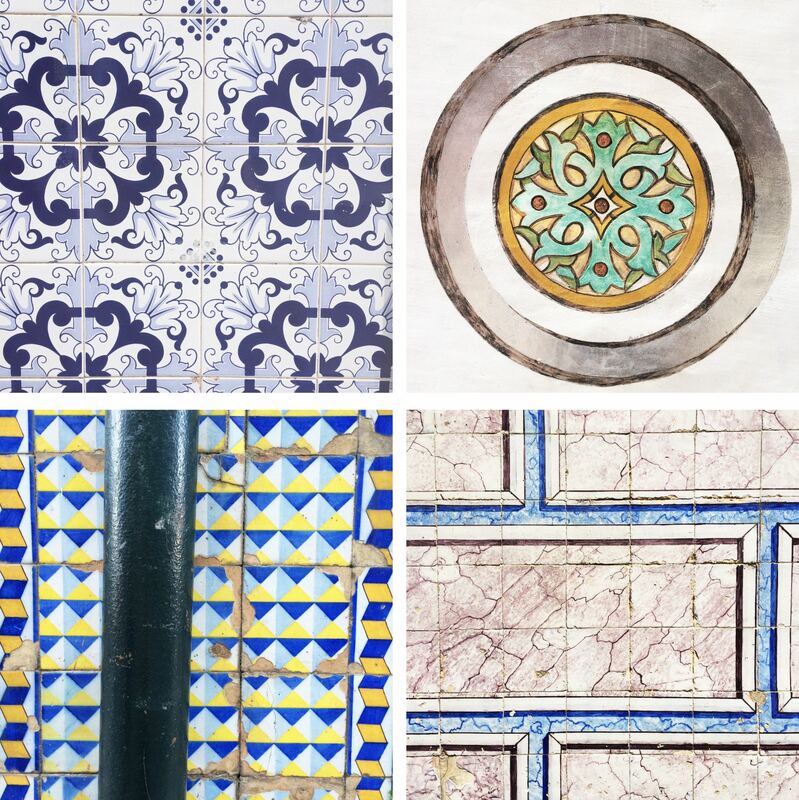 One of my favourite parts of this first day was spotting all the different styles and patterns of tiles on the buildings. I made it my mission to take a photo of each new shape and colour I could find. 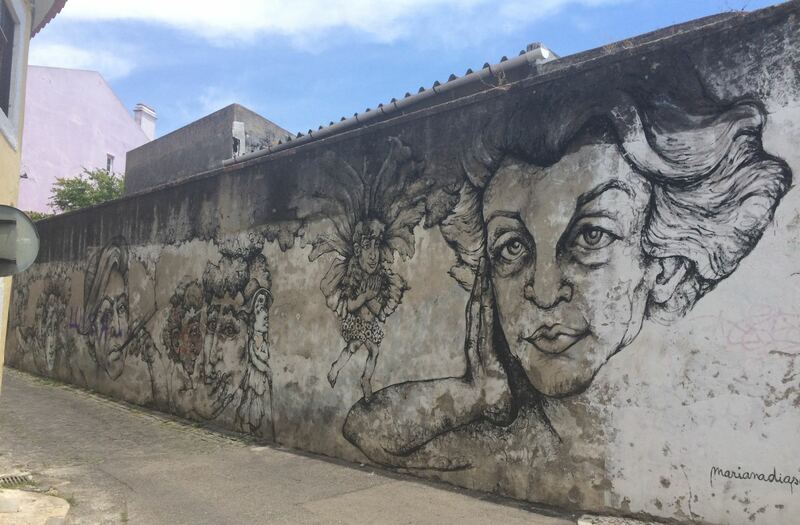 Another part of the fabric of Alfama is the street art, giving the district a bohemian, artistic vibe, where art and music come together. Hidden graffiti livens up otherwise run down structures. Left: Walking back down the hill. Right: Arco Grande de Cima. Between Igreja de São Vicente de Fora and the Panteão Nacional is the Mercado de Santa Clara Feira da Ladra, a fleamarket open on Tuesdays and Saturdays. 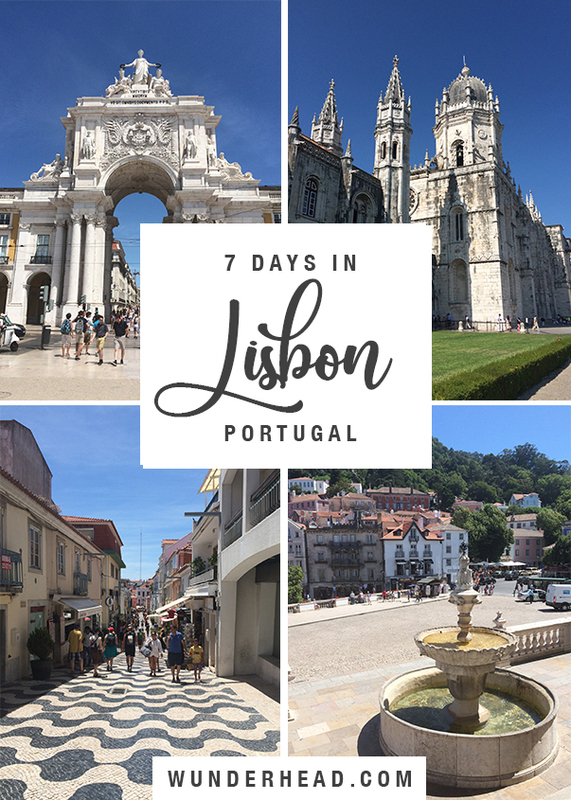 Depending on the days you’re in Lisbon, you can either visit on your walk or later in the week (we saved it for our last day in the city). Colourful houses on Campo Santa Clara. 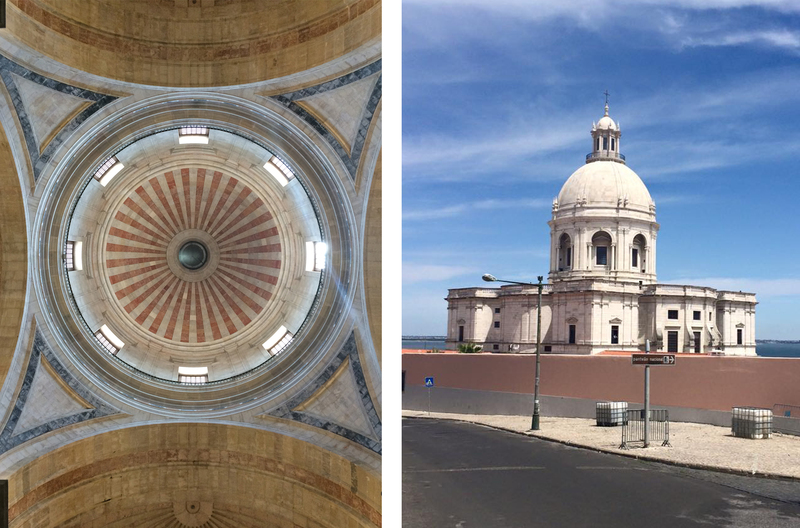 A 17th-century baroque church, the Panteão Nacional is now a mausoleum where many national celebrities are buried. The pale stone church is surrounded by pastel pink buildings and cobbled stone streets, giving the whole area a very pinterest-tastic aesthetic. Left: Campo Santa Clara, the road the circles the Panteão Nacional. Right: Up on the roof. Once inside you can climb to the roof of the church and walk all the way around the dome, which gives you views all the way out to the other side of the river Tagus. Left: Inside the dome. Right: The Panteão Nacional from Campo Santa Clara. 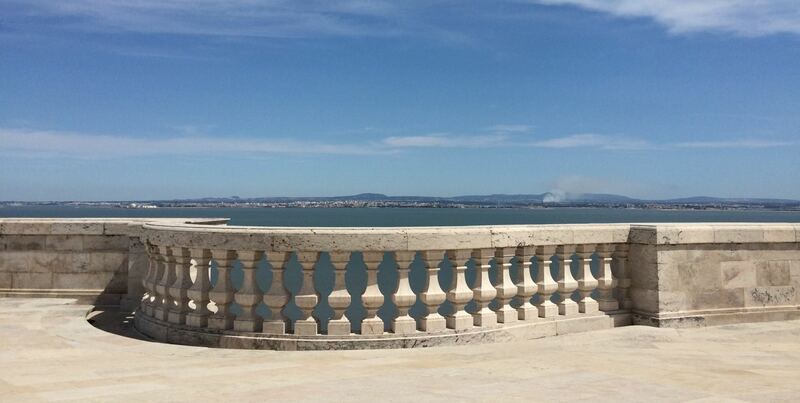 The view over the river Tagus from the Panteão Nacional roof. 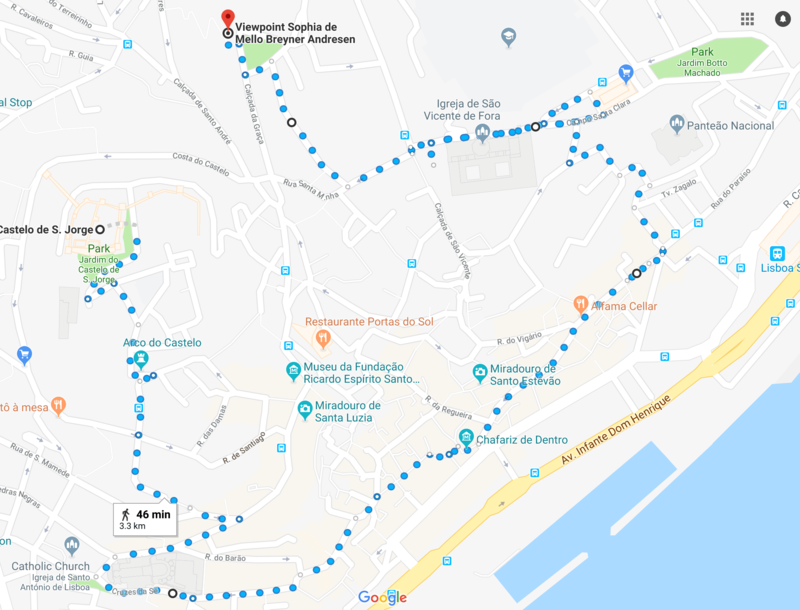 After you’ve had your fill of the Panteão, it’s time to cross through Alfama towards the centre of Lisbon and the Cathedral. Streamers over R. dos Remédios. 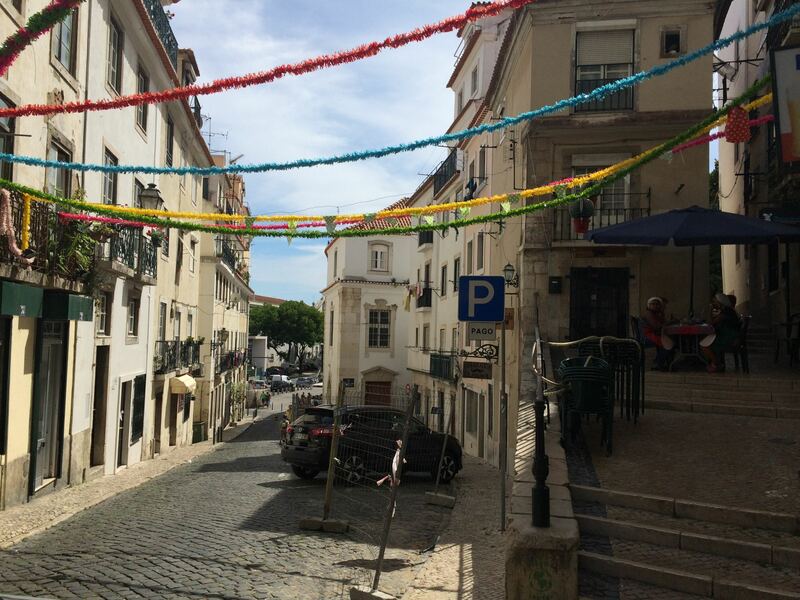 Walking through the winding streets of Alfama you’ll pass lots of little cafes and bars with locals sat out on the curb, drinking Ginjinha or simply Ginja (a portuguese liqueur made from sour cherries), and listening to Fado music. R. Jardim do Tabaco across from the Fado museum. Confession time: I’m a thoroughly English being, and I don’t deal well with the heat. At this point on the walk I was really feeling the effects of the Portugese summer, so we ducked into this cafe for cold drinks and spent a good hour stretched out on the comfy chairs. 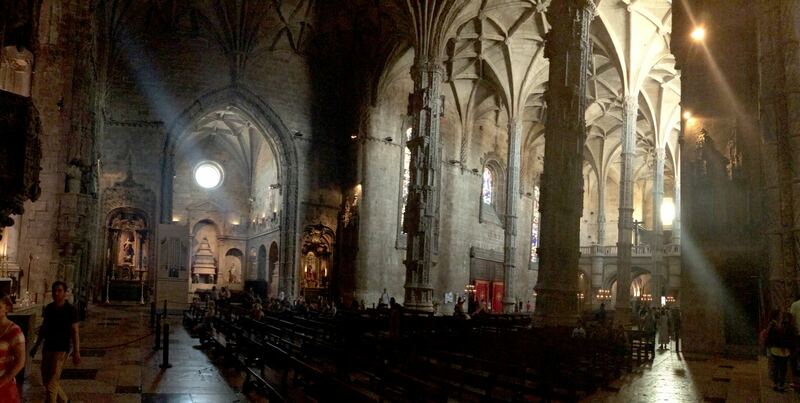 The oldest church in the city, Lisbon Cathedral has survived many earthquakes and been rebuilt a bunch of times. This has resulted in a few different architectural styles, including Gothic cloisters, a Romanesque rose window, a Baroque sacistry, a neoclassical chapel and Medieval facade. Left: The facade of Lisbon Cathedral. Right: The Cathedral from Rua da Alfândega. 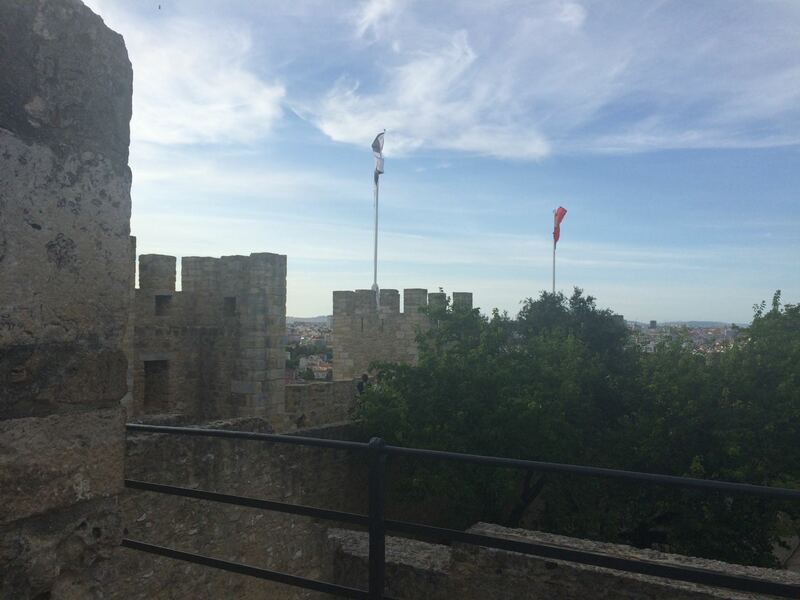 The walking route ends at Castelo de São Jorge, a Moorish castle which crowns the hilltop and looks out over the city. It’s a strongly fortified citadel with many different sections, making it a lot of fun to explore. Left: The courtyard of Catelo de S. Jorge. Right: On top of the ramparts looking out over the river. The view over Lisbon from Castelo de S. Jorge. After such a busy first day you deserve a delicious meal! 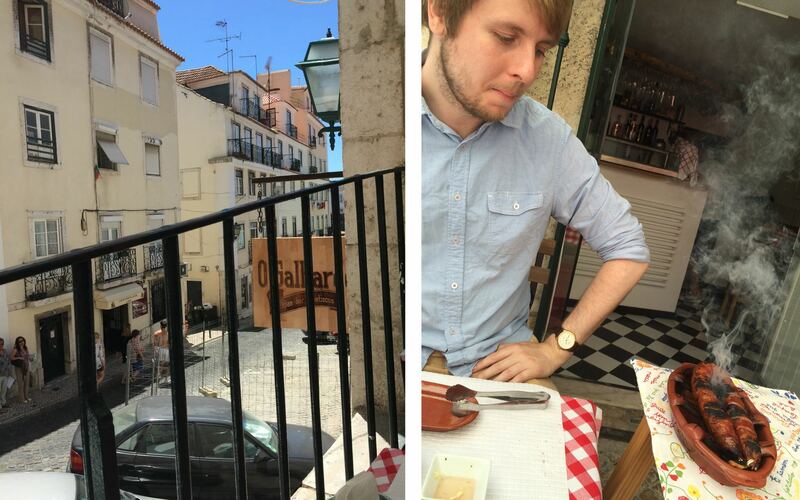 We got dressed up and ventured out into Alfama, ending up in Alfama Cellar, a cute little restaurant where we managed to land a table right in the open window. Left: R. dos Remédios. 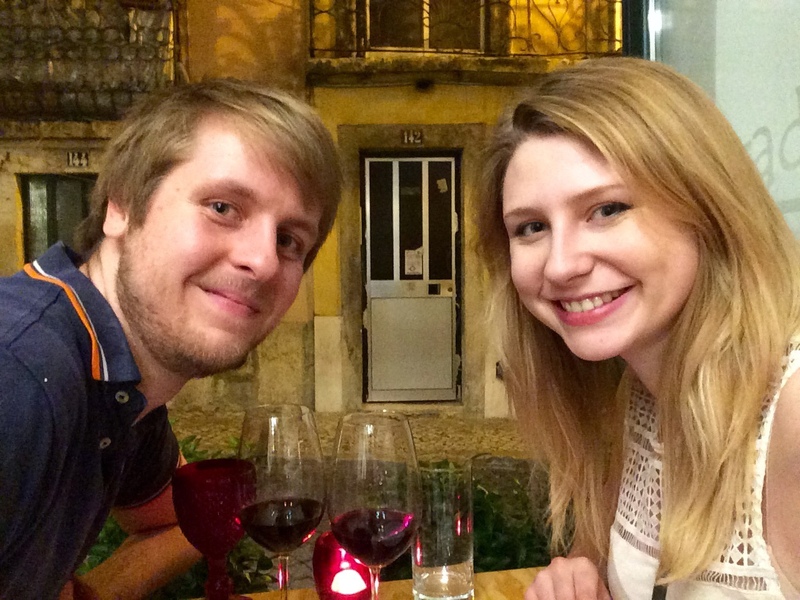 Right: Enjoying a glass of wine on our first night in Lisbon. Time for a day trip to the beach! 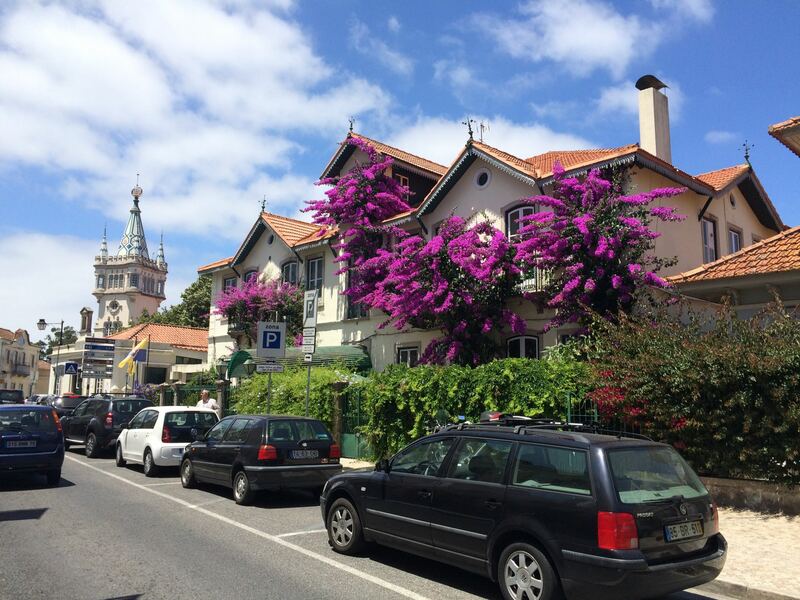 You can get to Cascais from Cais do Sodré, the train station on the western side of Lisbon centre. Heads up, this station is difficult to navigate if you don’t speak Portugese. We queued for ages for the self serve machines only to discover you can’t use your Lisbon Metro card to travel outside of the city. What you need to do is queue to talk to a real person, so you can ask for return tickets to Cascais. This funny little seaside town almost feels like a beach theme park, with striped cobbled streets, brightly painted buildings and hoards of visiting tourists. The striped cobbles of R. Frederico Arouca. Did I mention I’m not great with heat? 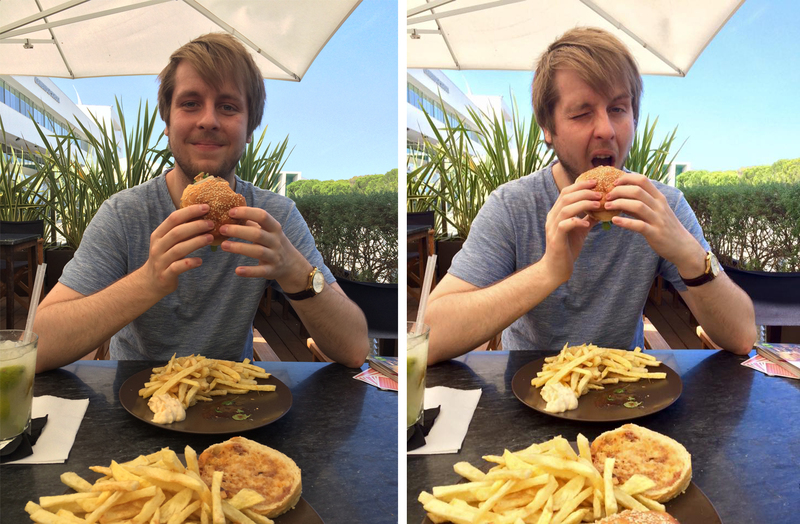 I needed a break from the sun after just the walk from Cascais station. 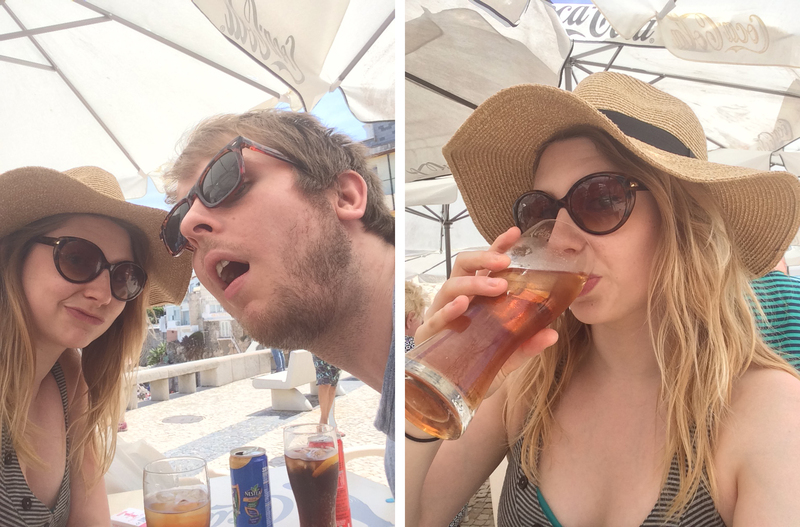 We found a parasoled table at Bar Esplanada Rainha with a beautiful view over the beach, and tucked into some cold drinks. Chillin at Bar Esplanada Rainha in Cascais. Next up: lunch. We strolled around the stripy streets looking in at the bustling restaurants, all of which were completely packed. 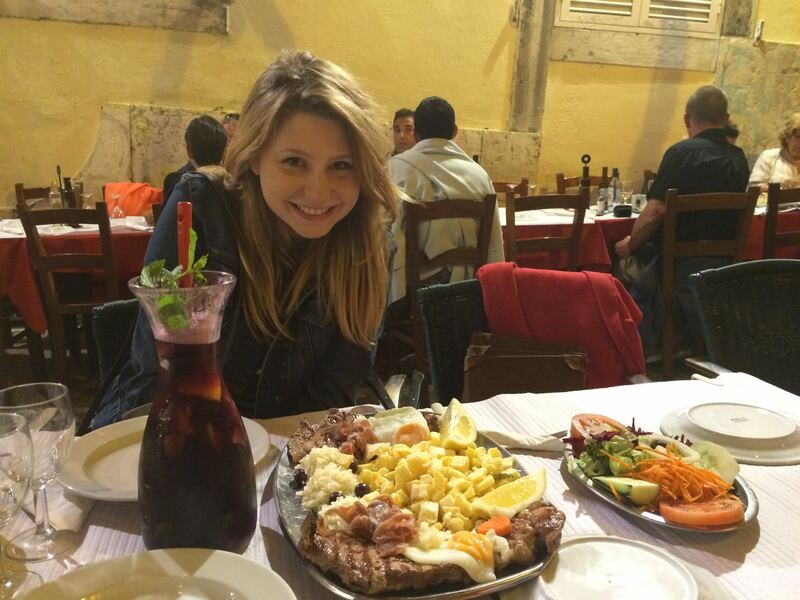 We ended up at Restaurante Marítimo on Largo Cidade de Vitória, and enjoyed some very fresh fish and delicious crusty bread. It’s safe to say if you spend the first half of this day like we did, you’re fueled up and ready to enjoy an afternoon on the beach. 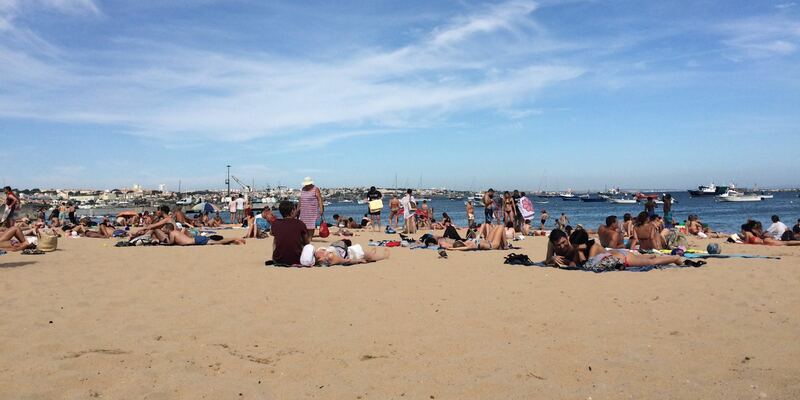 There are a few beaches in Cascais, and we chose the least crowded of the options, Praia da Riberia. It also seemed to be the one most popular with the locals, and the Cascais volley ball team even rocked up to practice. 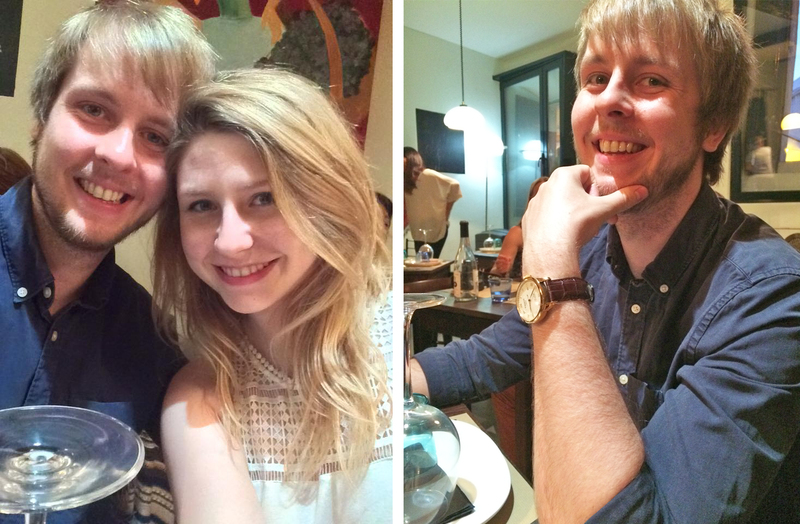 When we returned to Lisbon that evening we were sunsoaked and exhausted, and opted for a quiet meal in our airbnb. 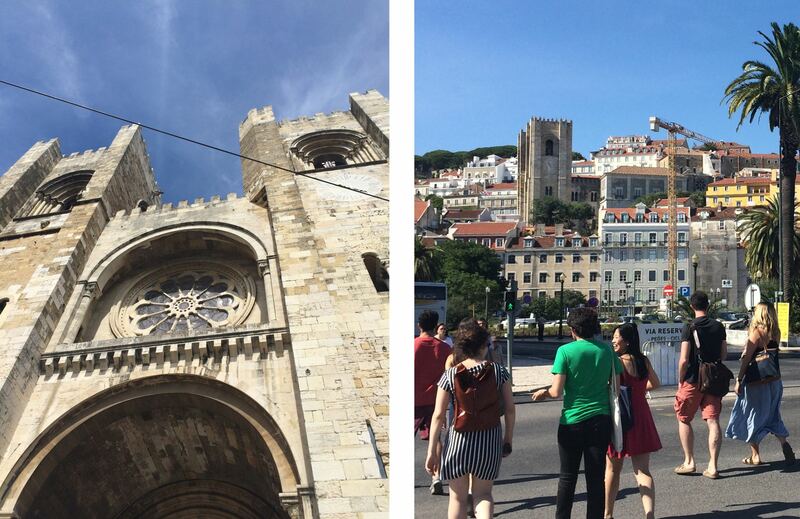 Time to explore the Western side of Lisbon! I think the Convent of Our Lady of Mount Carmel was my favourite place in Lisbon. 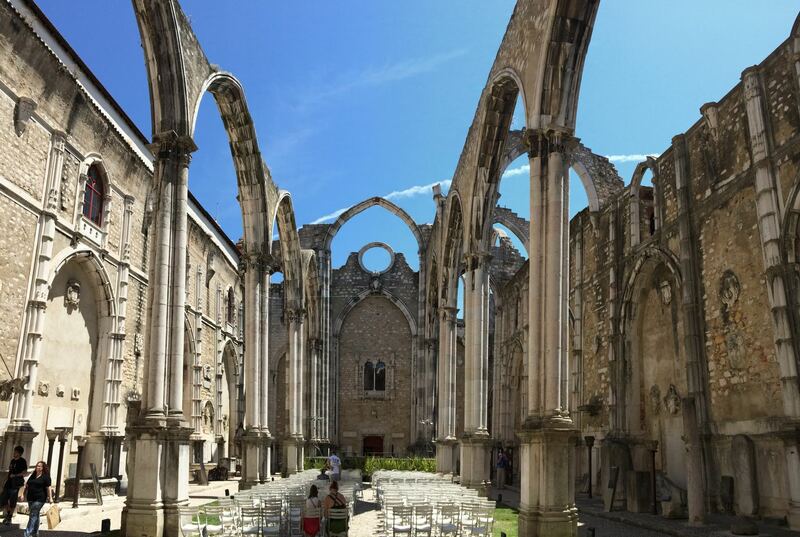 Destroyed in the 1755 Lisbon earthquake, the convent has no roof and is gradually being taken back by nature. Left: The entrance to the convent on Largo do Carmo. Right: Convent selfie! The convent was never fully repaired and the religious order was expelled in 1834. Nowadays its home to the Museu Arqueológico do Carmo, with tombs, fountains, windows and relics from all periods of Portugese history. Convento do Carmo often hosts music events under the open sky. While we were there the convent was also setting up for a concert that evening. 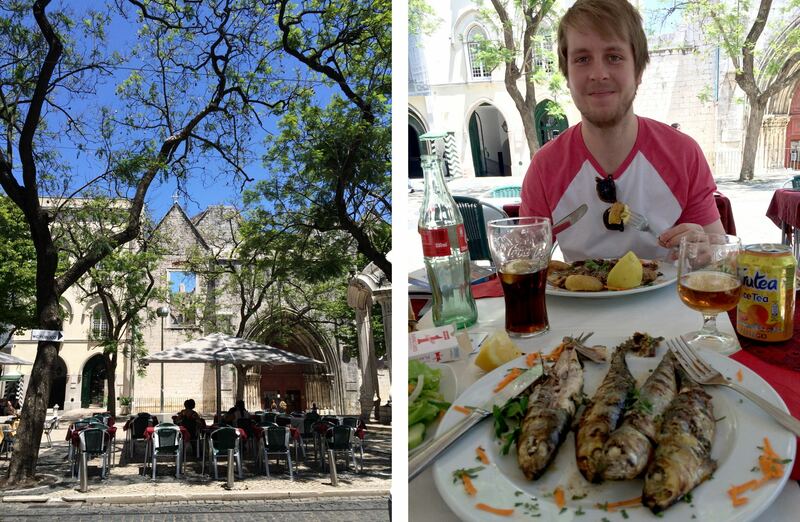 After our morning tour of the convent we decided to have some lunch at one of the restaurants around the square. We chose Restaurante Internacionale and had some delicious grilled sardines with fresh lemon juice. 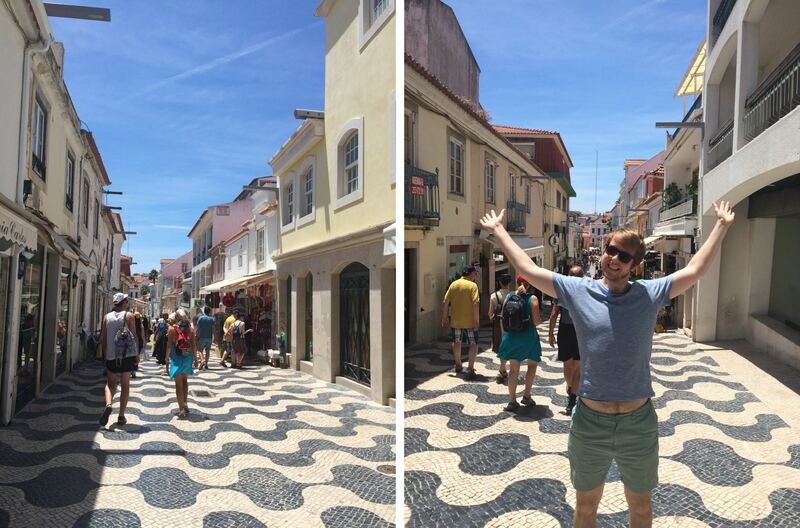 Left: Restaurants on Largo do Carmo. Right: Grilled sardines from Restaurante Internationale. 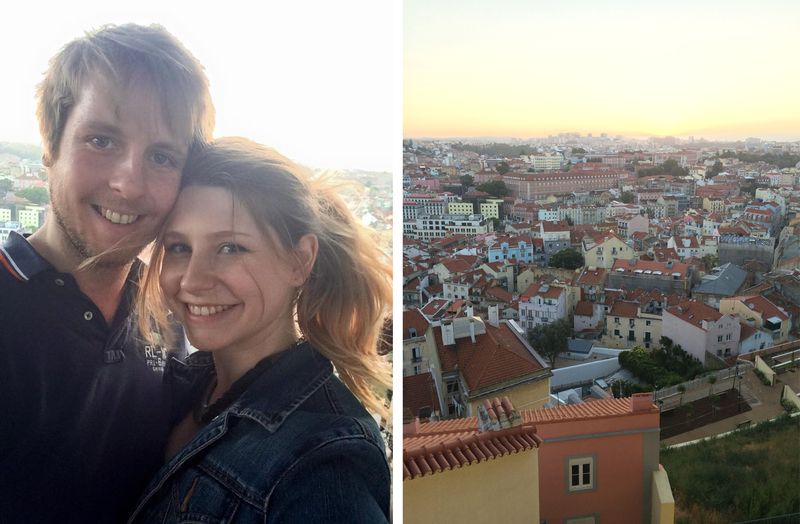 There are loads of viewpoints in Lisbon, but not many where the viewpoint is as pretty as the view! Miradouro de São Pedro de Alcântara is a terrace garden with fountains and lots of benches, perfect for relaxing and enjoying the panorama. The landscaped terrace of Miradouro de São Pedro de Alcântara. 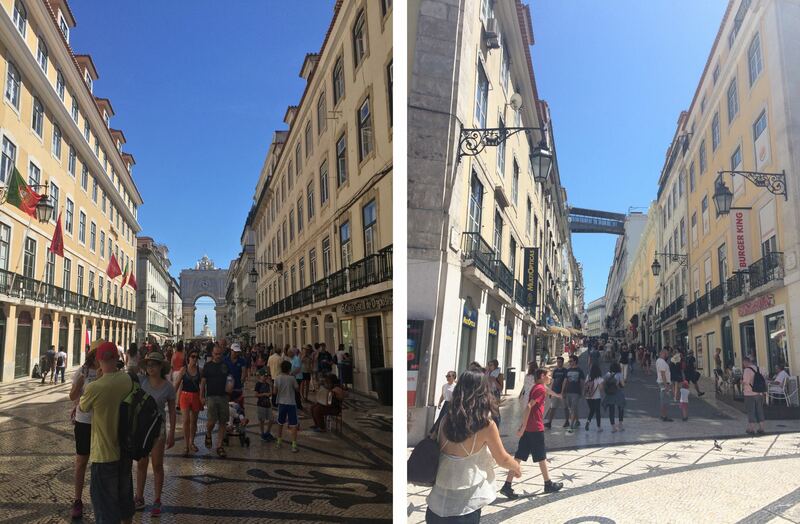 The main road through the centre of Lisbon, there are tons of sights to see on Rua Augusta. 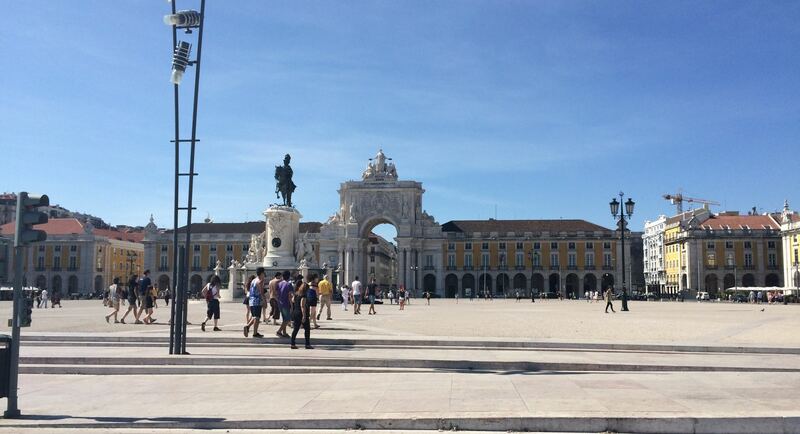 Start at Praça Rossio, stroll through Praça da Figueira and wonder down the decorative cobbles. 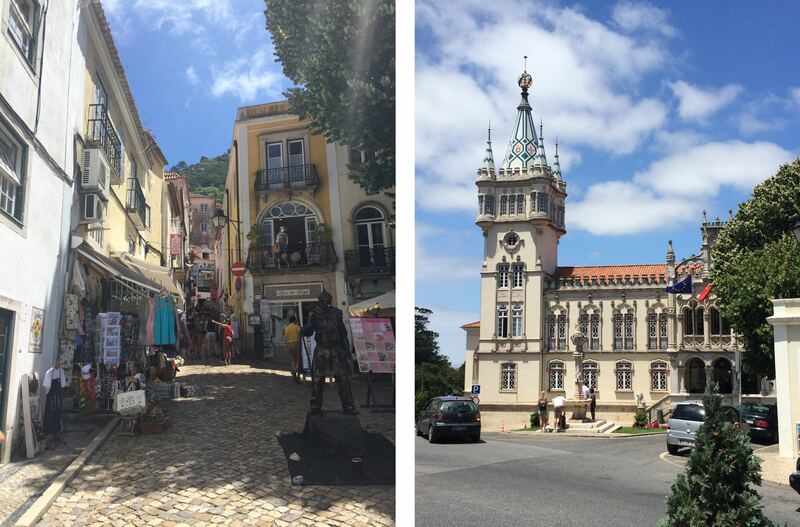 We had a look at a few shops and nipped down a side street to seethe Santa Justa Lift (a cast-iron lift built in 1902), before checking out an exhibition at MUDE (Museu Do Design E Da Moda). Left: Arco da Rua Augusta from the street. Right: Santa Justa Lift platform from R. do Carmo. 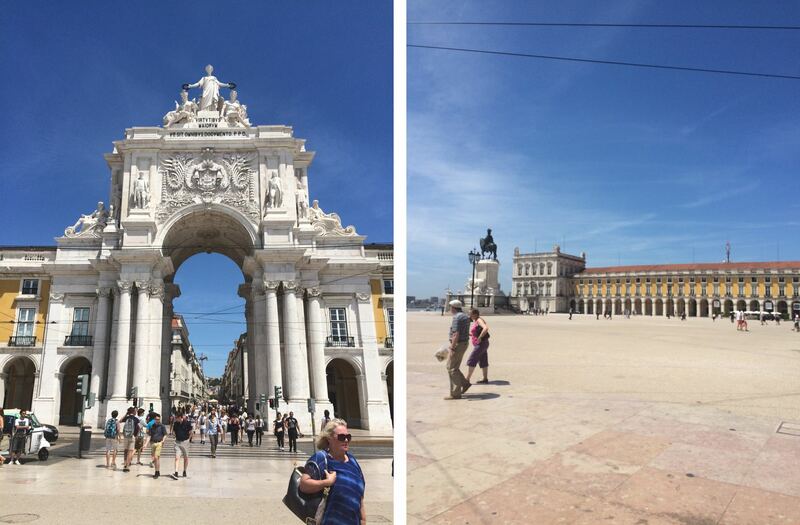 At the end of Rua Augusta is Praça do Comércio, a huge square that acts as the gateway to Lisbon from the sea. Praça do Comércio from Av. Ribeira das Naus. It was built after the original monument on the same site – the Ribeira Palace – was destroyed in the 1755 earthquake. The towers on the two edges were modeled in the same architectural style as the original palace, and reminded me of Versailles in Paris. Left: Arco da Rua Augusta. Right: Museu de Lisboa on the Western corner of Praça do Comércio. The fourth day of our trip was Matt’s birthday, so we chose this day to visit the Lisbon aquarium. You can get here by train from Santa Apolónia station in Alfama, getting off at Estação do Oriente. 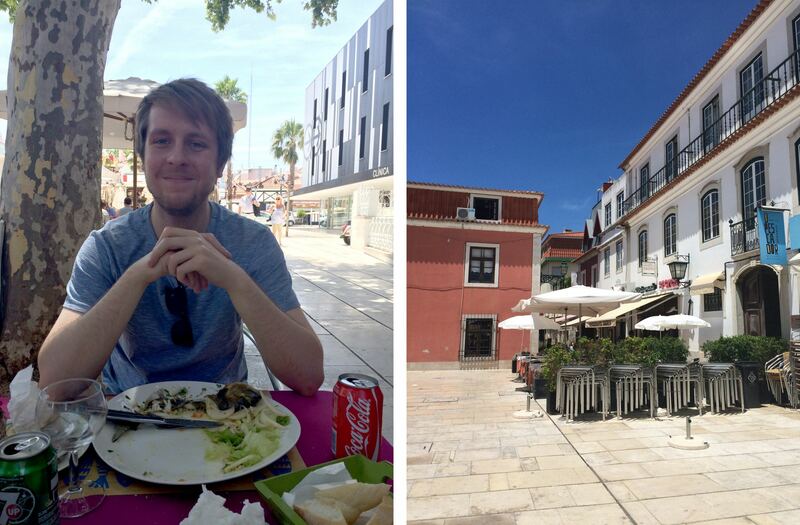 This whole area up the river from Lisbon feels very open and modern compared to the city centre. Recently redeveloped, there are tons of open spaces and waterside restaurants, a big casino and shopping centre. Waterfront restaurants on Alameda dos Oceanos. Matt chose Honorato as his birthday lunch, where we had very satisfying burgers and chips with a view out over the river. Enjoying burgers and chips at Honorato. I love aquariums! So in my opinion the Lisbon Oceanarium is one of the must visit attractions for your holiday. The building sits out on the water like a glass and chrome ship, and often houses temporary modern art exhibits along with the permanent sea life and ocean ecosystems. Oceanário de Lisboa on river Tagus. 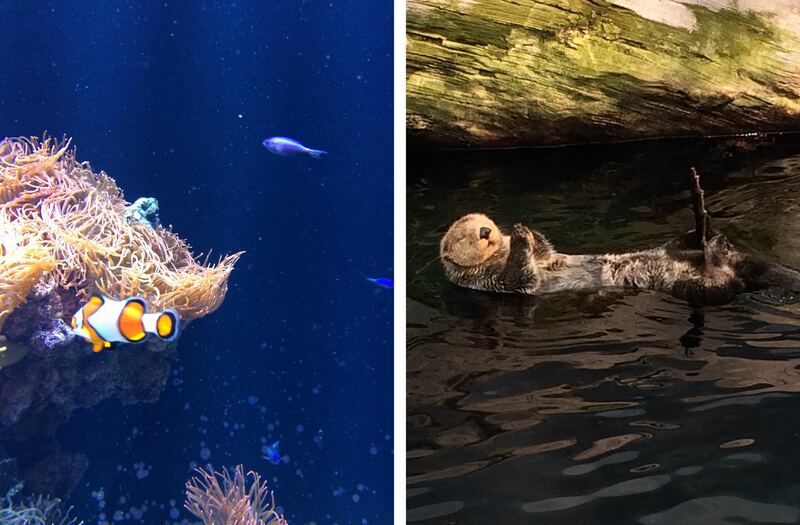 Inside the aquarium you’ll find sharks, penguins, rays and tropical fish, but the highlight for me was the otter room, with two adorable sea otters playing together. Fun fact: Did you know otters mate for life and hold each others’ paws when they sleep so they don’t float away from each other? Left: Clownfish swimming around anemone. Right: A sea otter cleaning its fur. 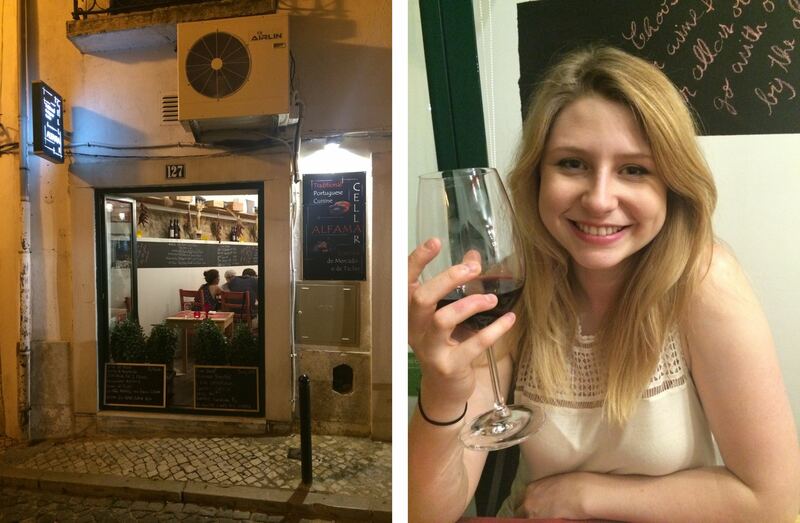 Our dinner when we returned to Lisbon was at one of the restaurants spilling out onto the pavements of Calçada do Duque. We were given this area as a recommendation by someone who had been to Café Buenos Aires and loved the atmosphere of the outside tables and street entertainment. Tables outside on Calçada do Duque, with views towards Catelo de S. Jorge. We ended up at the Solar du Duque, and enjoyed a pitcher of sangria and a huge platter of steak and potatoes, perfect after a long day of looking at fish. The lights strung overhead and the beautiful view over the night skyline were topped when a series of street musicians set up camp on the steps nearby, and one after the other played to us as we ate. Left: Matt enjoying his birthday dinner. Right: Street entertainment. At the end of the night Matt went inside to use the bathroom (as this was part of the recommendation) and it was only at this point that we realised we were not, in fact, at Cafe Buenos Aires as we had intended, but the restaurant next door. Oh well! A happy accident, as for me the food was still excellent and the main attraction was the vibe of the whole street. Calçada do Duque at the end of a lovely evening. Time for another day trip! This time it’s to Belém, and you’re departing from Cais do Sodré again. 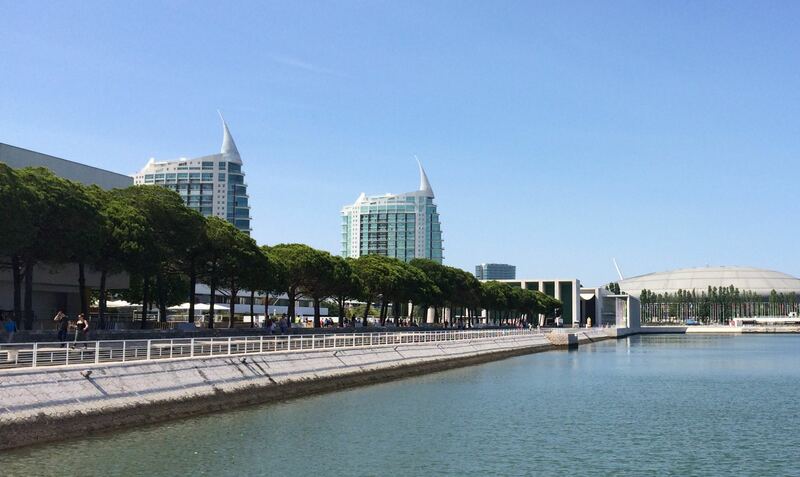 When you arrive at the station, walk along Avenida Brasília and you’ll get to the Torre de Belém, another ceremonial gateway to Lisbon from the sea. It’s built on a small island away from the shoreline, so you have to cross a wooden walkway to get to it. 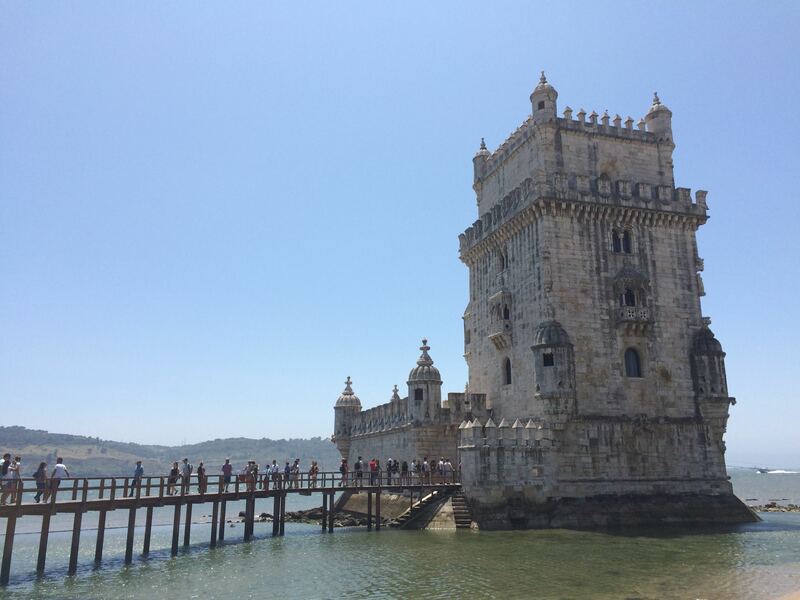 Torre de Belém, built out in the river Tagus. 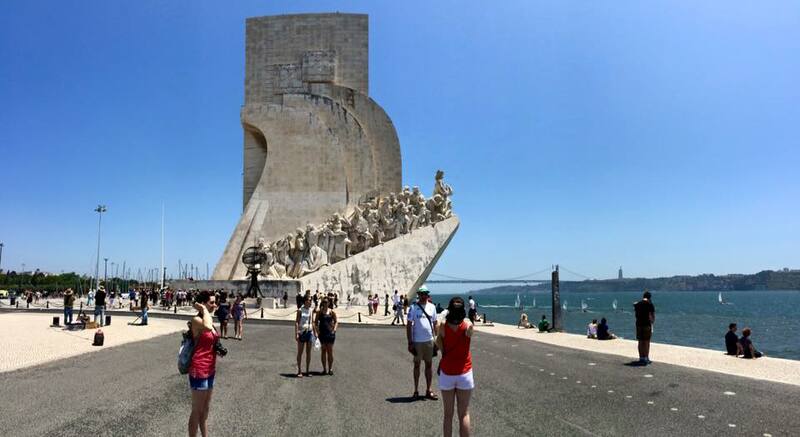 The Monument of the Discoveries was built in 1940 on the spot where ships departed to go to India or the Orient during the 15th and 16th centuries, to celebrate the Portugese Age of Discovery. The Monument of the Discoveries was supposed to be a temporary construction, but was rebuilt in the 1950s. Just on the water looking out over the monument is our lunch spot, Nosolo Italia, which as you may have guessed serves Italian food. 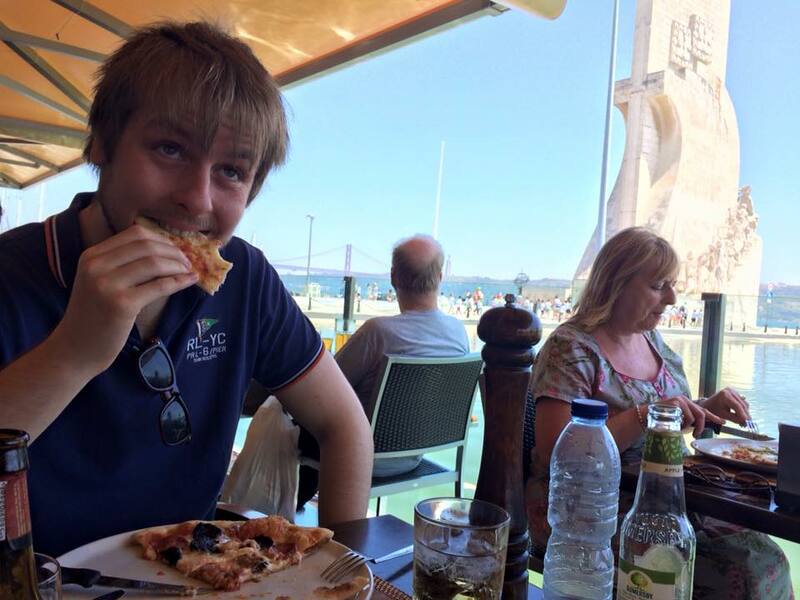 We were famished after our walk to the tower and back, so a pizza was just what we needed. Which is better, the view or the pizza? 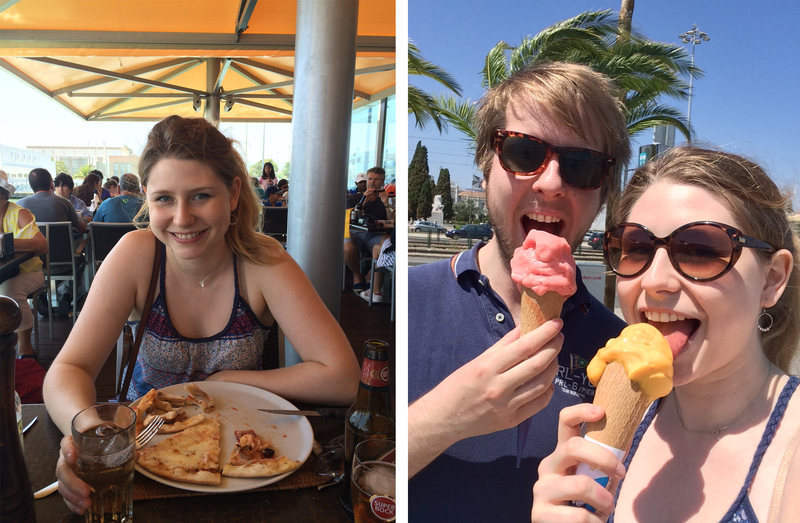 We also treated ourselves to some Italian gelato before heading into Belém, which as you can see started melting almost immediately! Pizza and gelato from Nosolo Italia, Belém. 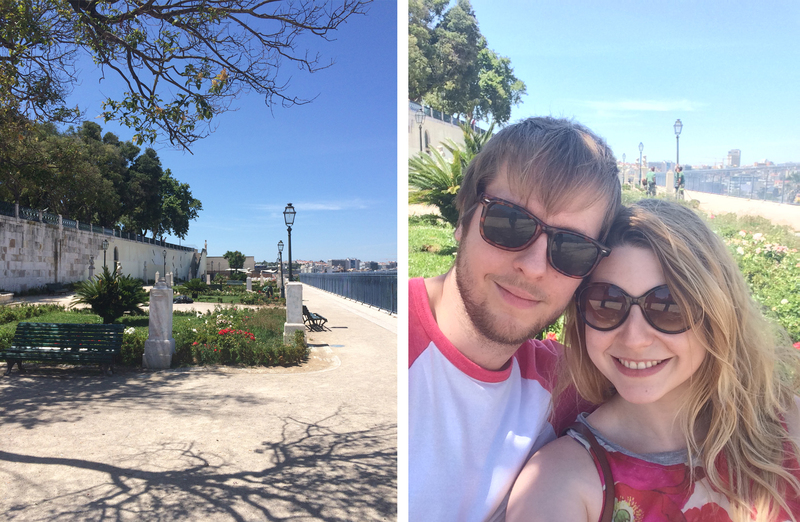 We enjoyed our gelato on a bench in the beautiful Jardim da Praça do Império, the first of three large gardens on the riverfront of Belém. 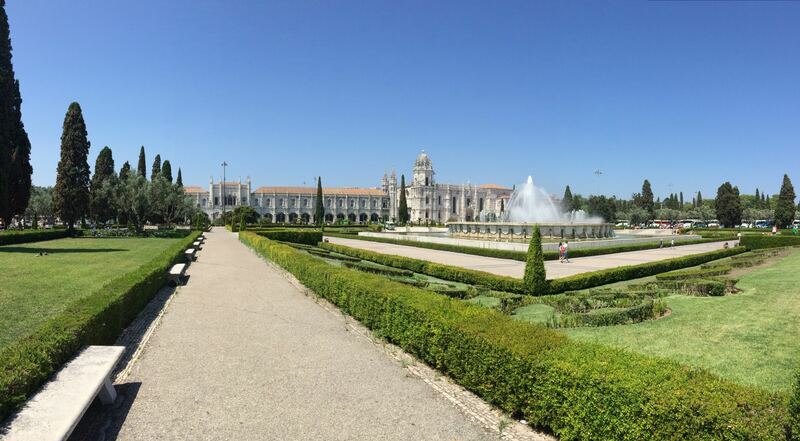 Jardim da Praça do Império in front of Jerónimos Monastery. The Berardo Collection Museum houses contemporary and modern art, with permanent collections of Picasso, Pollock and Warhol, and temporary exhibitions that change regularly. We spent a couple of hours walking around, a very interesting way to escape the hot sun for a moment. 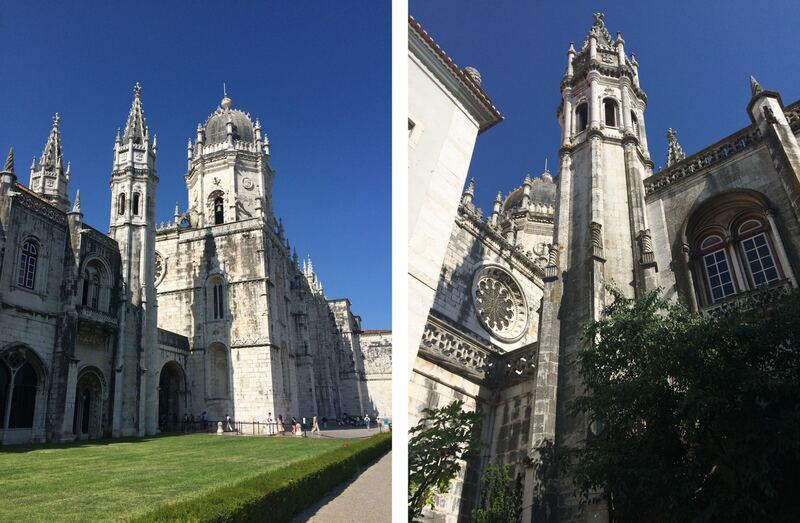 Next up we popped into the gothic style Jerónimos Monastery, which used to house the monks of the military-religious Order of Christ. Now it houses the Museu de Marinha and the Calouste Gulbenkian Planetarium, and often plays host to exhibitions and ceremonies. Jerónimos Monastery from Praça do Império. The Túmulo de Luís de Camões. Sneaky snap inside the church. 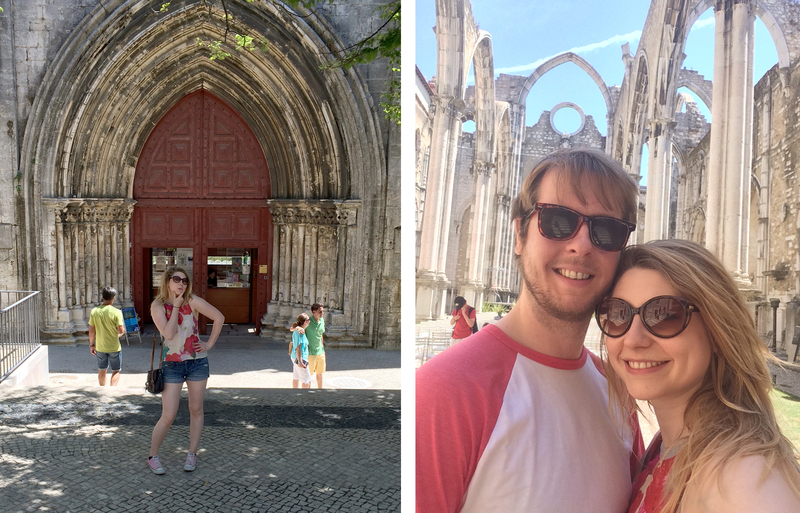 Visiting the Pasteis de Belém bakery was easily one of the highlights of the whole trip. The bakery itself was in a beautifully bright and airy building, with tiled walls and stone floors, and the sounds and smells of fresh pastry being made wafting through archways from room to room. We ordered some pasteis and the warm crispy pastry filled with creamy centre, perfectly caramelised on top, arrived at our table for us to enjoy. My only regret is that we didn’t have more. Walking back up to our airbnb at the end of a busy day. After our dinner we decided to revisit the Miradouro Sophia de Mello Breyner Andresen and watch the sun set over the city. Left: Sunset selfie. 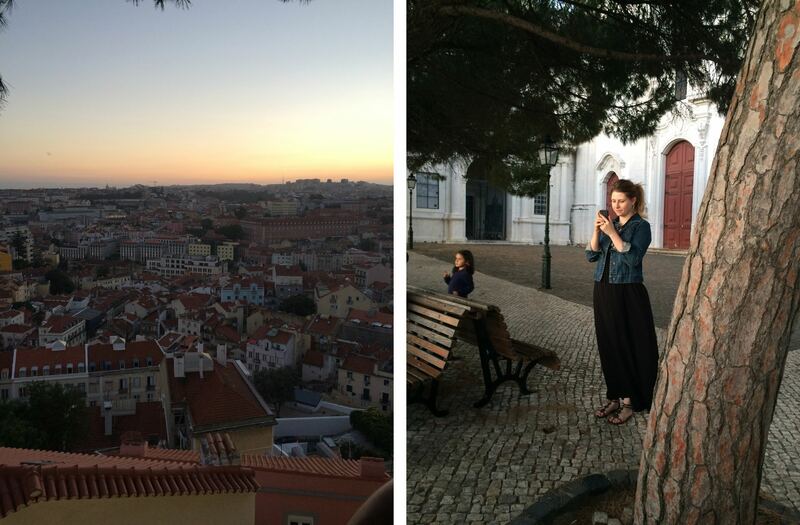 Right: Beautiful warm colours of Lisbon at sunset. Panoramic view from Miradouro Sophia de Mello Breyner Andresen. Left: The sun sinking deeper past the horizon. Right: Igreja e Convento da Graça in Largo Graça. 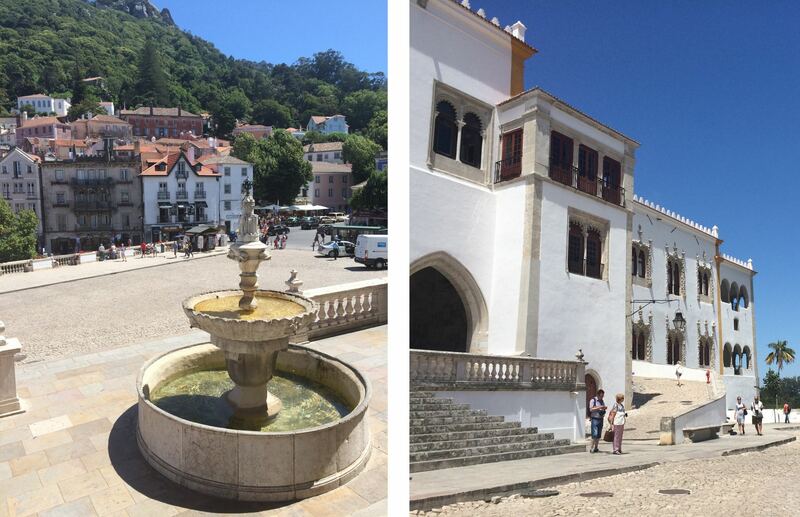 Our fourth day trip of the week is to the beautiful Sintra, which you can get to by train from Rossio station. Beautiful climbing plants on R. Dr. Alfredo da Costa. The beautiful town of Sintra nestles in the foothills of the Sintra mountains, with forested views stretching out all around. If you have the time you can also visit the hilltop Pena National Palace, known for its whimsical architecture and colourful design. 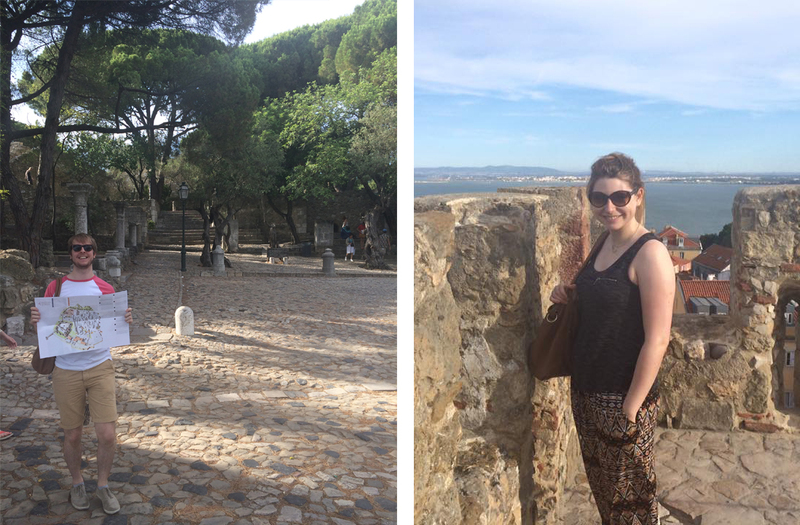 Since we only had a day, we focused our time on the Moorish- and Manueline-style Sintra National Palace. Left: R. Padarias across from the Palace. Right: Câmara Municipal, the Sintra townhall. 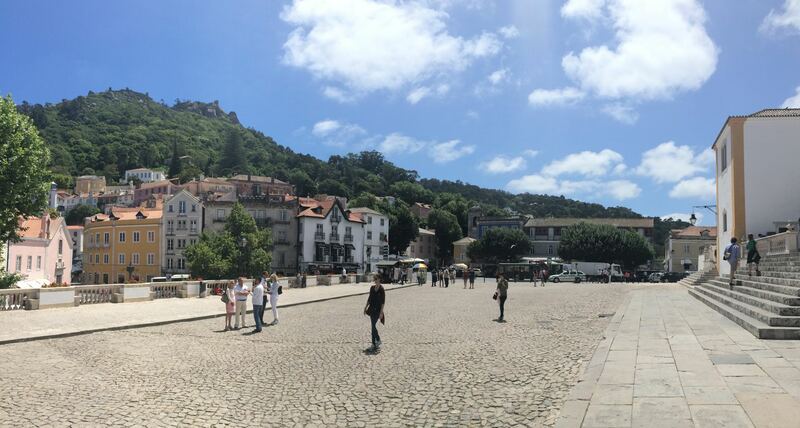 The walk from the Sintra train station to the palace weaves its way around the valley, on a road called Volta Duche that has many of its own attractions worth visiting, including the Museu Anjos Teixeira and the Fonte Mourisca. 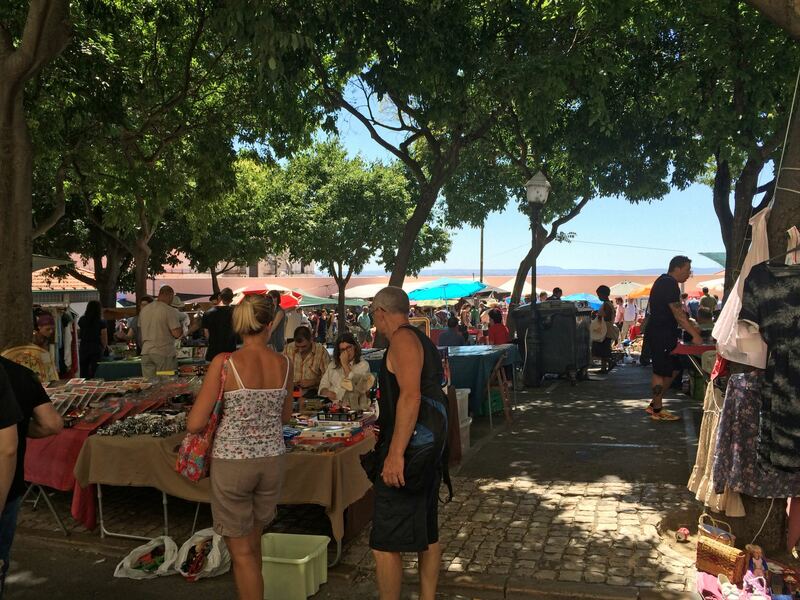 It is also littered with people selling local items, jewellery, art and crafts, making it a very pleasant walk. We grabbed a bite to eat in one of the many restaurants before heading into the palace to have a look around. Left: The view from the Palace. Right: The Palace facade. The Sintra National Palace is the best preserved royal residence in the whole of Portugal, and now serves as a historic house museum. My favourite section was the kitchen with its enormous twin chimneys. 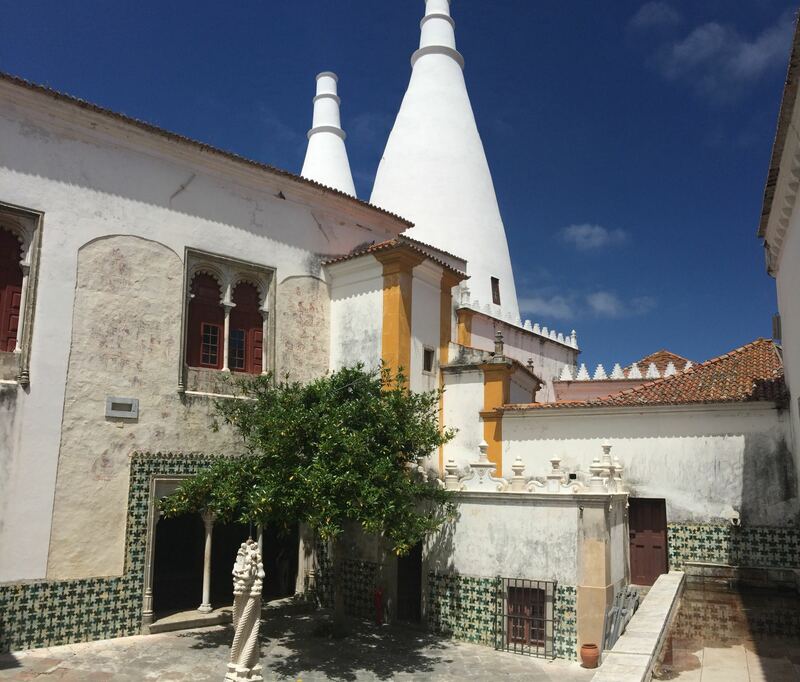 One of the courtyards in Sintra National Palace, with a view of the twin chimneys. The oldest part of the palace is the royal chapel built in the 14th century, but many different sections of the palace were built at different times in history, giving it a patchwork of architectural styles including Moorish and Gothic-Renaissance. Largo Rainha Dona Amélia in front of the Palace. 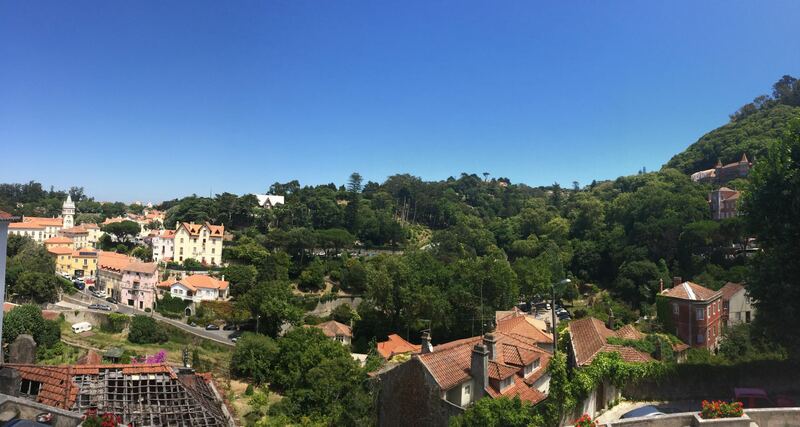 The view over Sintra from the palace. All in all Sintra was a wonderful day out, with its pastel villas spread out over the leafy hillside, and all the history of the palace to learn about. 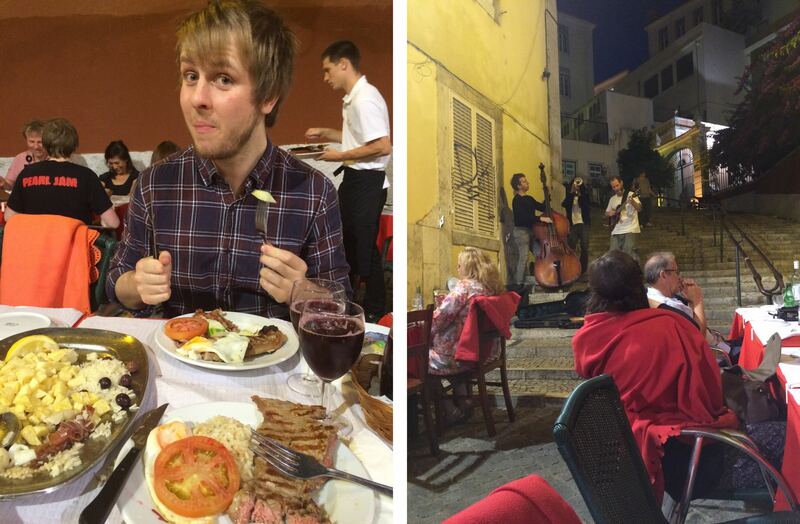 For our last night in Lisbon we decided to experience some of the traditional music from the Alfama District – Fado. 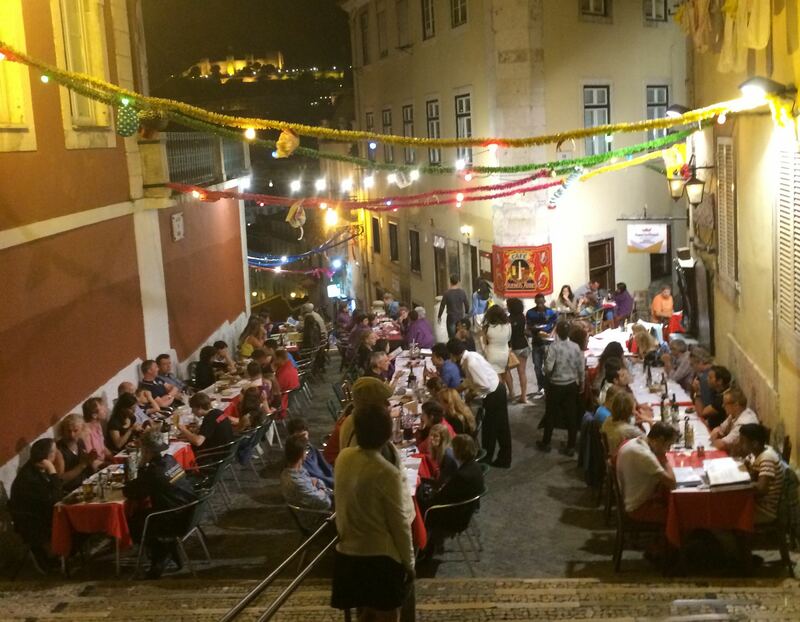 We found Arcaz Velho on road Calçada do Forte earlier in the week, and booked a table when they would be putting on a live performance. We didn’t really know what to expect, and we ended up having a wonderful evening, with delicious food served between songs. The Fado was emotionally performed by two separate solo singers, supported by a guitarist, and we enjoyed it so much we both bought their CDs afterwards. 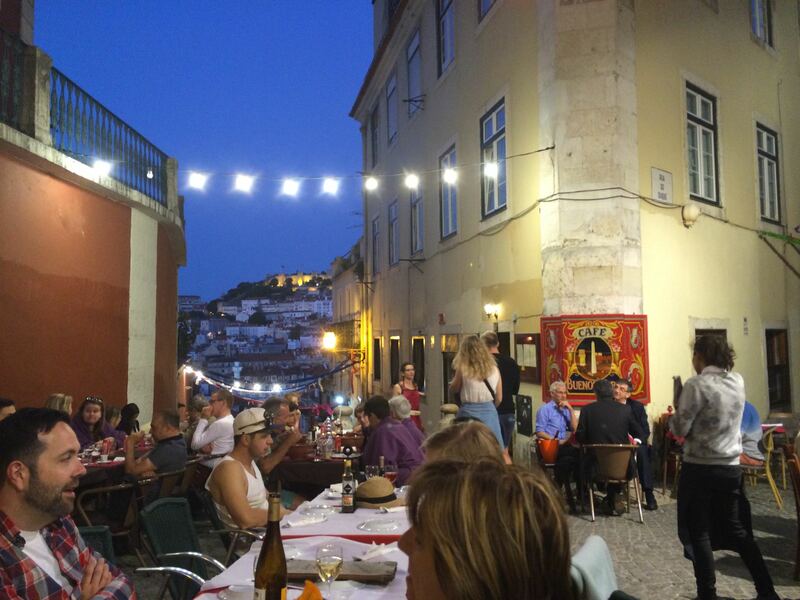 Having a great time at Arcaz Velho in the Alfama District. I highly recommend you try to experience some Fado on your trip, as it captures the heart and soul of this historic district. 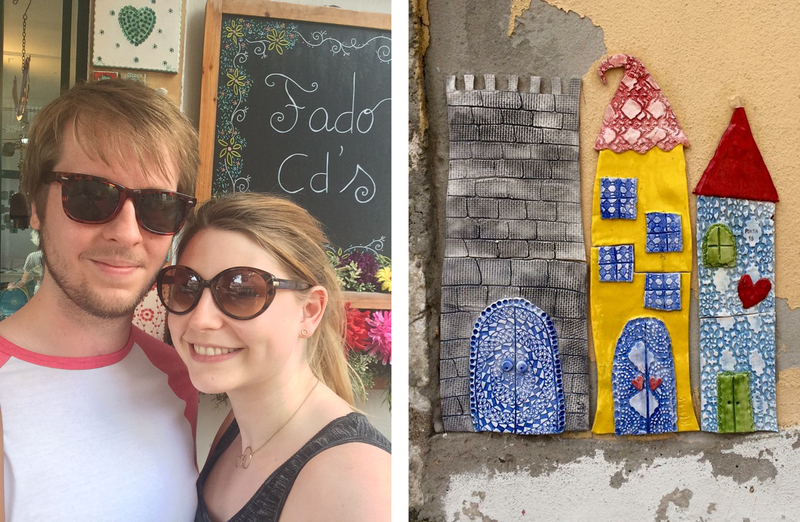 On our last day in Lisbon we revisited all our favourite places in Alfama. Behind the Igreja de São Vicente de Fora is the fleamarket Mercado de Santa Clara Feira da Ladra, brimming with locals and stalls of all kinds. We bought some beautiful photo prints of Lisbon windows and doors, which have been hung in our living room every since. Mercado de Santa Clara Feira da Ladra. We also had some drinks and played cards at the bar outside the Fado museum, but since we’d run out of all our euros we couldn’t get tickets to go inside! 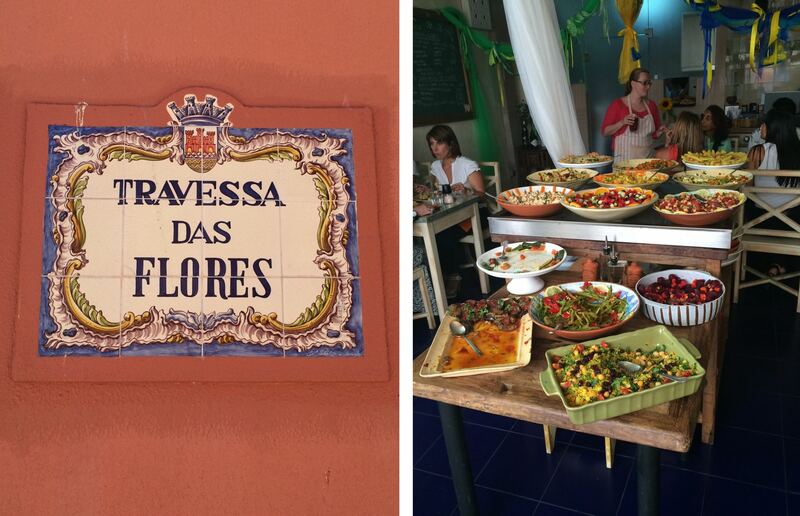 On the corner of R. dos Remédios you’ll find a cluster of little local restaurants, including O’Galhardo, a tiny place run by one man, with simple and delicious traditional Portugese tapas. Left: R. dos Remédios. Right: Chorizo from O’Galhardo. 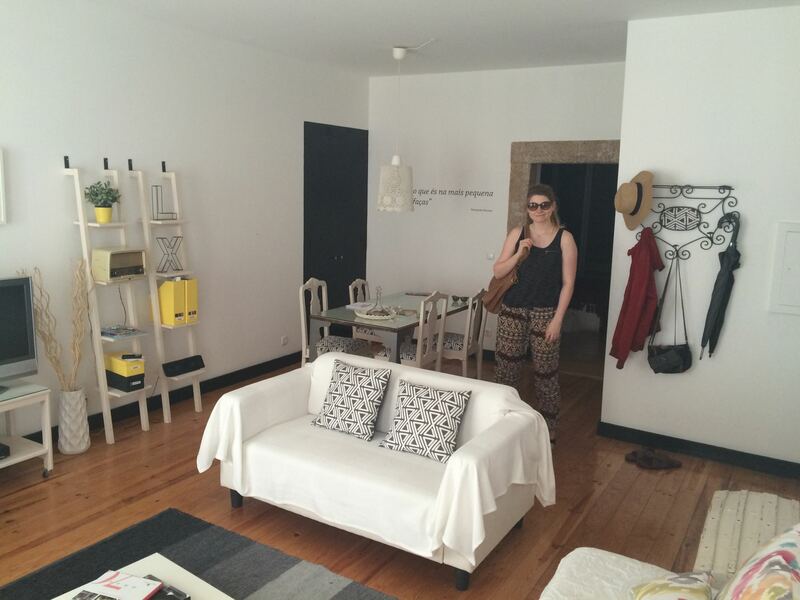 We were simply thrilled with our airbnb in Alfama, which came with a fully equipped kitchen and was decorated in a charming and minimalist style that suited the trip nicely. 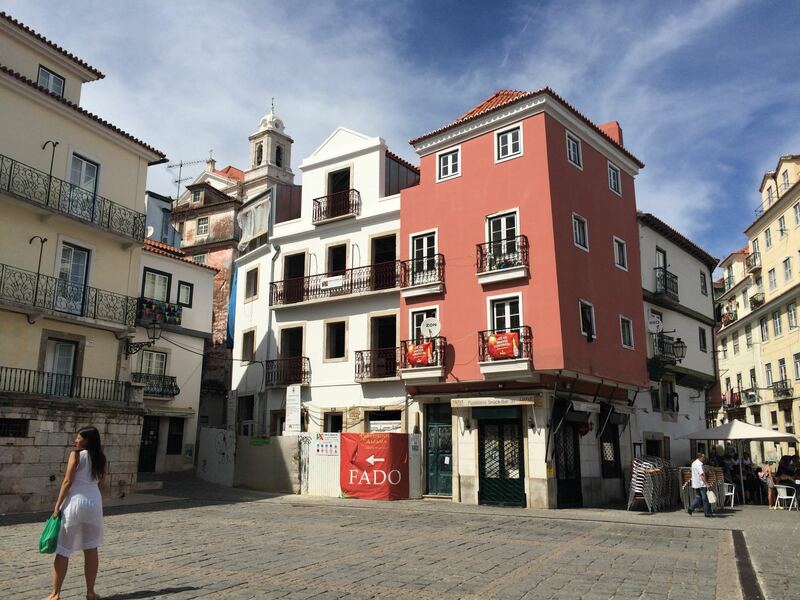 Wherever you choose to book, I really cannot recommend Alfama enough, as the historic centre it has so many winding streets, little restaurants and tiny shops. 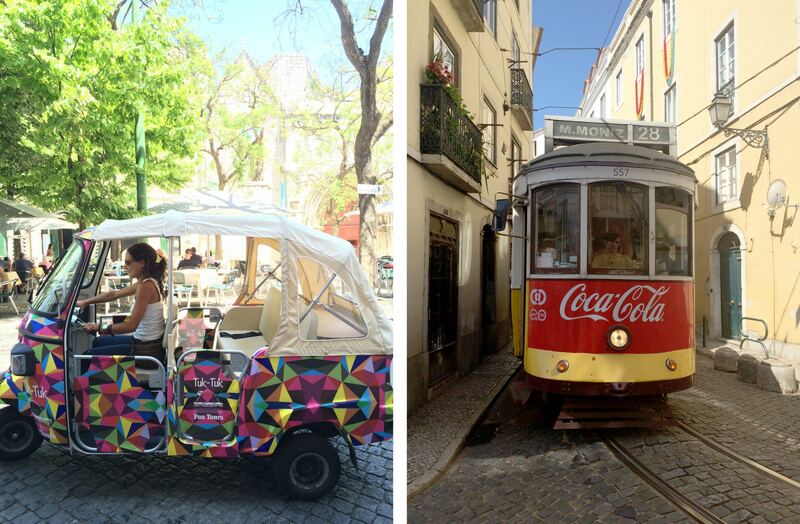 We walked everywhere within Lisbon, but you can also take advantage of all the tuk-tuks and trams, especially the historic line 28 which runs through Alfama. 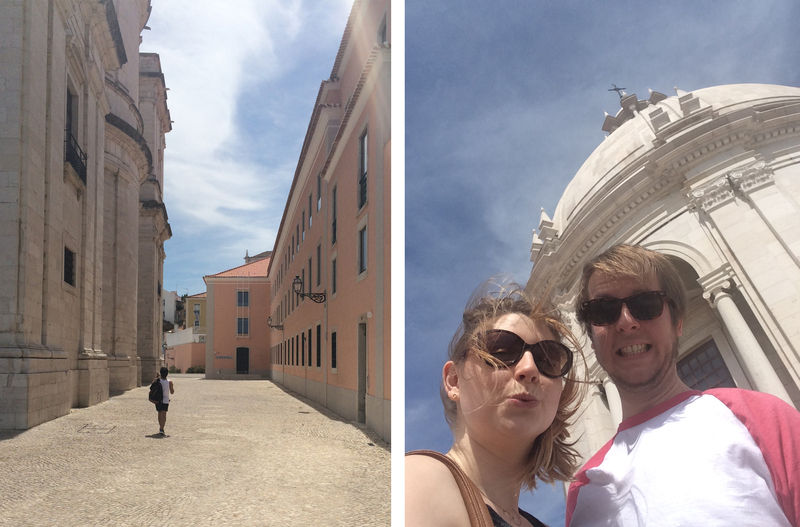 Lisbon has been one of our favourite holidays, with beautiful things to see and lots of interesting history to learn about. There’s plenty to fill up a week’s holiday, and I can tell you we both highly recommend it.